Shopping for Teenage Mutant Ninja Turtles Water Bottles? Hydrate with style! This Teenage Mutant Ninja Turtles Go Ninja Go Ninja Go! Plastic Water Bottle is just about the best thing for you to carry your water around in if you're a fan of Teenage Mutant Ninja Turtles and constantly on-the-go. Able to hold up to 25 ounces of liquid and featuring a cool green design with the Teenage Mutant Ninja Turtles logo along with the words, "Go Ninja Go Ninja Go!" 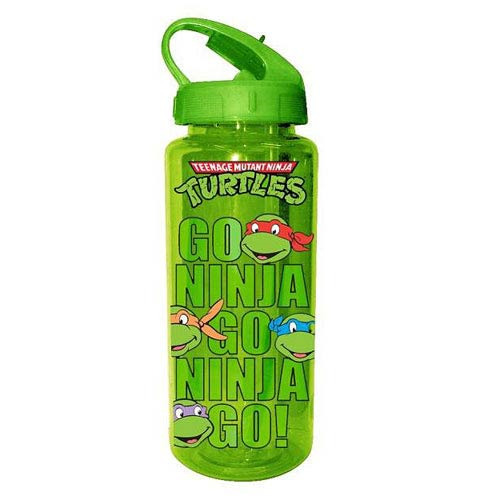 and the faces of each Ninja Turtle, this great water bottle is perfect for use at the gym, school, or wherever you want!